On any given sunny or wickedly stormy day, when we step our feet onto our sailboards and with our booms in our grasp, sheet in, and the wind fills our sails, we start to move. Leaning out over the water, our eyes look ahead. We search for bumps to jump or smooth spots to glide over. We race our friends, or we search the shoreline ahead for today’s destination. If instead, we were to look up at our sails, we’d see the foiling of the cloth as it fills with wind. That may be all that we want to know about a sail: it’s there, it’s beautiful and it’s giving us freedom. But high-performance sail-makers look at other things going on in the sail that make or break our enjoyment of that watery ride. 1. Let’s start with Twist. What is it? The sail’s leading edge obviously aerodynamically important, but not so obvious is what’s happening at the back of the sail above the boom on the trailing edge (called the leech). A sail-maker knows that this area is either twisting or it’s not. Let’s find out what this twisting means for you as captain of this personal ship. Sail-makers have their own language; here are the sail-maker’s terms for different parts of the sail. Looking down the leech, one can see that it is either a straight line from clew to head, or perhaps convex with a smooth arc, or maybe concave, or any combination of the above. The amount of sail area that projects backwards from the straight line from the head to the clew (see diagram) is called roach. When the sail is full of wind, this roach and trailing edge of the sail can “open-up” or “twist” away from the front of the sail. Generally, more roach will have more twist. The location of the roach up the leech will also dictate where the maximum twist will occur. Adding to this list of variables, a flatter sail profile will twist more than a fuller profiled sail. Why do we need Twist? Sail-makers are keenly aware of how their sails are twisting because of these two facts: well designed twist will de-power a sail in order to make it more controllable in gusts and strong winds, and secondly, twist can prevent the upper part of the sail from stalling. How does twist stop the upper part of the sail from stalling? The wind angle at the top of the sail is different than at the bottom of the sail. This difference comes from a wind gradient that exists and causes wind strength to be less nearer the surface of the water and stronger higher up. So, the bottom of the sail experiences more apparent wind, which comes from the direction the board is travelling. The top of the sail, on the other hand, “feels” more of the true wind direction. If the top of the sail were set with no twist the flow of air would not stay attached to the surface of the sail and the flow would stop or “stall which would then have detrimental effects over the entire sail. In a sentence, a sail that does not twist is less aerodynamically efficient. Where should the maximum twist be located? Since the angle of the wind widens as you go up the sail, it stands to reason that the maximum twist should be located at the top of the sail. If the maximum twist is below the top of the sail, either the sail will stall in the head, or it will lose power from the twist being too low. How does twist cause a sail to de-power and how is this different than a stall? The section of the sail that is twisted still has the airflow attached, but produces less aerodynamic lift force. Stall means the flow is not attached and that part of the sail is producing no aerodynamic lift. *Can be broken up into the three edges: luff, foot, and leech. Luff curve is the amount of curve that is built into the front of the sail. A sail with more luff curve will require more downhaul tension and have a more rigid profile. A sail with less luff curve will be easier to downhaul and have a softer profile. Luff curve is also used to control leech twist. The straighter the luff curve, the flatter the sail and the more the leech twists. 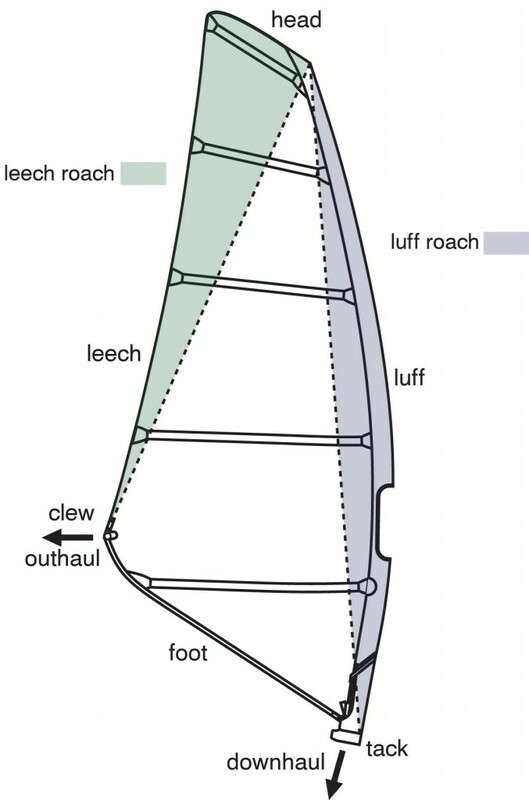 Foot curve is the amount of curve along the edge of the sail from the tack to the clew. Wave and freestyle sails tend to have less foot curve so that the foot stays out of the water during moves. Slalom and race sails have more foot curve so that they can be raked back to close the gap between the sail and the board. Closing the gap greatly increases the speed potential of a sail. The Leech is the back edge of the sail running from clew to head. The leech area extending back beyond the straight line from clew to head is called roach. The point of maximum roach will usually correspond with the point of maximum twist. As we discussed above, the maximum twist should be at the top of the sail; therefore it stands that the maximum roach also be at the top of the sail. David Ezzy developed the Endo-Batten for windsurfing sails in 1998 to achieve a symmetrical profile and help batten rotation. A sail shaped with excess luff curve has more luff curve than the curve of the mast after being rigged. This forms a cavity next to the mast, which, in the case of a full batten sail, becomes batten rotation. The problem with sails shaped with ONLY this method is that in strong winds, the mast bends more, which removes the shape from the front of the sail. Sewing panels together that have curved seams achieves panel shaping. Once the panels are together, they assume a predetermined aerodynamic profile. Panel shaping when used in conjunction with excess luff shaping produces a more stable sail profile. Panel shaping can be vertical or horizontal. Horizontal shaping is usually under the battens and is a better shaping method than vertical shaping because it controls the shape from luff to leech. Battens are used to hold out the roach of the leech and to set the profile in the sail. One problem with traditional full batten sails is that they are asymmetrical because the battens all sit on the same side of the sail. Flipped one way and the battens push against the firms sail body, pushed the other way, the battens raise off the sail as they push against the soft pocket material. This can be seen in many sails when they have high downhaul, the batten fronts want to “s” and also the foot batten wants to only set in one direction (pushing against the pocket). The symmetry problem is solved with our endobatten design batten pocket. “Endo”, meaning inside, places the batten symmetrically in the center of the sail. 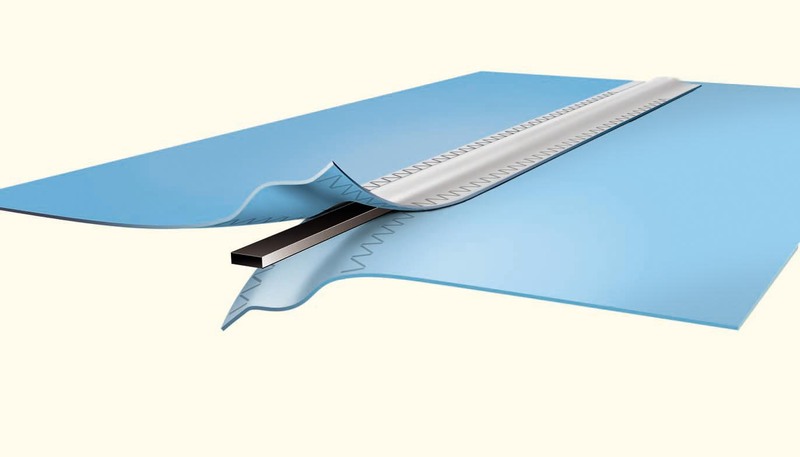 We have eliminated the batten pocket and instead place the batten in the center of a horizontal profile seam. The endobatten produces a perfectly symmetrical sail and saves all the weight of the batten pockets. Most sails when sitting unloaded have the battens rotated hard around the mast. This is a rotational sail and represents a sail that has most of the profile built in via excess luff curve shaping method. Over the years, we have discovered that rotational-type sails are wrong. They produce exactly the opposite sail shape that you want. When unloaded or in light wind the lower and middle battens of a rotational sail rotate hard around the mast. Since they do not have much, if any, profile in the sail body they assume a very flat and draft forward profile- not a desirable profile for light air. Then as the rotational sail gets in more wind, the battens get pulled from beside the mast to behind the mast. The result is more draft in the back of the sail – not a desirable shape for high wind. So, you can see that the rotational sail works in exactly the opposite way it should. It goes from a flat draft forward profile in light air to a deeper draft back profile in stronger wind. This translates into a sail that jerks you forward in light gusty wind and then gets backhand pressure in the in strong puffs. It would be better to start off in light wind with more profile in the sail, then as the wind increases to have the draft not get any deeper and not move back. 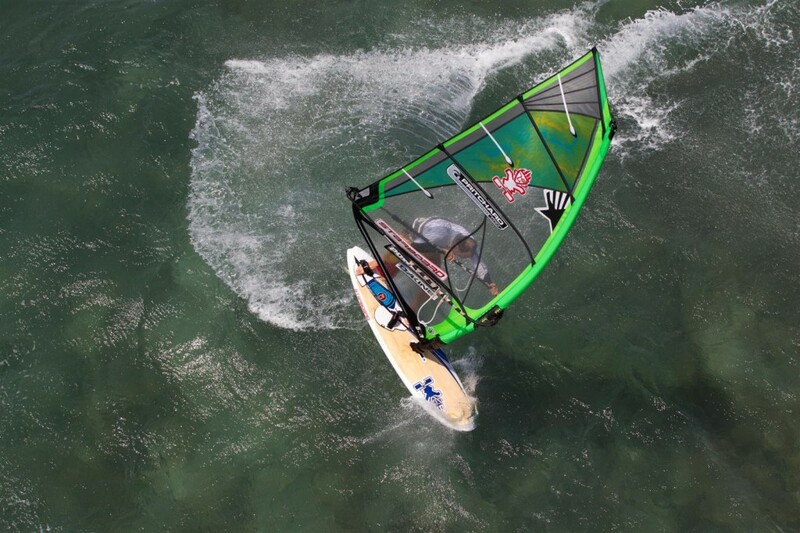 Ezzy Sails are formed with a different design concept than all other windsurfing sails. That means, when you tension the batten, the sail shape comes from the batten taper plus the profile in the seam. The result is a defined, exact, horizontal profile. Our sails are the exact opposite of most other sails that have very little shape in the panels and most of the shape coming from the excess luff curve. Ezzy sails are built to have very little batten rotation around the mast. When the sail is unloaded, we set the batten behind the mast in about the same place the traditional rotational sail type batten would be when loaded. Now combine this with the Endo-batten profile in the sail body and you have a much more stable profile. Plus you actually get the opposite function of a traditional rotational sail. In light air the batten is behind the mast and there is more profile back in the panels – good light air shape. Then as the wind increases the batten moves more beside the mast and this has the effect of moving the draft a bit further forward – good high wind profile. There is another added benefit in the non-rotational system, and that is that we are less reliant on mast stiffness, since our profile is not coming so much from excess luff curve, but more from profiled panels. This means we can use softer masts without loosing profile. Softer masts are not only easier to downhaul but they have a more “alive” feeling on the water because the luff retains a bit more shape while at the same time the leech is loose. And a wider arrange of masts will work. Tuning our sails is very, very different from other sails. If you set our sails like a traditional rotational sail they will feel terrible. The main difference in rigging is that our sails take quite a bit of positive outhaul tension. The outhaul is needed to pull the battens away from the mast. The wave sail takes as much as 5.0 cm or 6.0 cm of positive outhaul The outhaul not only flattens the sail, but also tensions the lower leech, which reduces unwanted lower leech twist. Our sails come with a string gauge that makes setting the outhaul very easy. In 2006, Ezzy Sails introduced the Ezzy Universal Cam system. The sail’s profile can be further defined and more stable with the use of camber inducers. Nowadays all cams are sail driven, which means the batten is in a closed pocket and does not connect directly to the mast. The cam acts as a spacer inside the sleeve. This kind of system is normally extremely mast diameter specific, which means you are limited to the particular mast designed for that sail. This becomes a real problem if your mast diameter does not match the mast designed for the sail. This is especially a problem if your sail was designed on a standard diameter mast and you want to use a reduced diameter mast. The Ezzy cam is also a sail driven cam, but it fits any mast diameter from a modern reduced diameter to a twenty year old standard diameter mast. The Ezzy cam has two thin arms that insert into a pocket. The pockets come in ten different lengths, which adjust the space inside the sleeve, keeping the sleeve tight at the camber. Each sail also comes three camber sizes to fit all mast diameters. Camber inducers extend the range of a sail. Light wind performance improves because the camber holds out the sail’s profile. High wind is also better because the camber stops the sail profile from shifting in big gusts. So for racing or sailing in light fluky conditions cambers are must. Camber inducers make the sail feel more rigid. Some like this feeling while others don’t. For people that are more concerned with maneuverability and easy jibing, no-cam is the way to go. With the proper rigging technique our camber induced sails rig almost as quickly as one without cams. We develop our own sailcloth. The Ezzy Sails Spectra® X-Film is the strongest and lightest windsurfing sailcloth in the world. We were the first sail company to laminate Spectra® yarns between two films. Our X-Film weighs about the same as standard 5-mil monofilm, yet it is more than 1,000 times stronger in tear strength. Sailcloth must be designed to match the specific loads in the sail. The luff experiences the most static load in a rigged sail, so the material needs resist stretch and have good needle hold strength. Leech has high load when the sail is in use, so the material must be very low stretch along the edge of the leech. So we use lightweight, ultra strong Technora cloth. The tack and foot areas are under constant abuse by harness hooks and board noses, so this area needs a very impact resistant cloth. We use a high-density form of our spectra x film. The window area of the sail needs to have good visibility and be impact resistant. Vinyl does not scratch, so you can always see through it. Vinyl also is very durable so the sail will last longer. The upper middle part of the sail has less directional loading and can therefore be made from a lighter weight cloth, but still needs to be impact resistant. For this we use our Tri-lite. The sleeve takes a lot of abuse from sharp rocks and broken masts. The sleeve needs to resist tearing in the longitudinal direction. We accomplish this with a weft-stop construction. 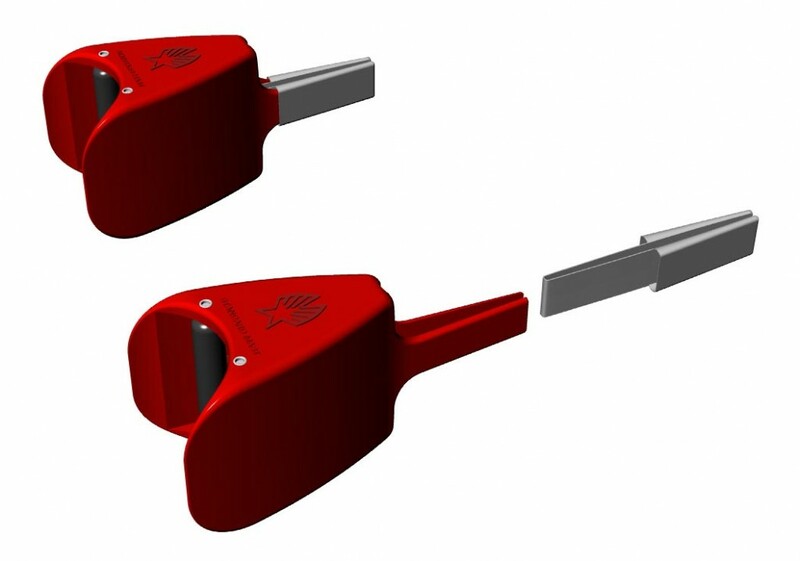 Our patented Power-On Head system regulates the twist in the head of the sail. It allows us to have a loose head and a tight head all in the same sail. The Power-On Head is a patented self-aligning head twist system. If the sail needs to twist more it can. All Ezzy sails have a 5.0cm wide luff reinforcement sewn up the luff as well as a folded 2.6cm luff tape inside the sleeve. Our sleeves are made up of two vertical curved pieces without any horizontal seams that could come apart. Our tack is reinforced with 12 layers of spectra X-film and two layers of polypropylene webbing. We engineered our exclusive Ezzy pulley to make the sails easier to rig and fine-tune. The tack pulleys are made completely with 316 stainless steel and are CNC’d to precision with an inner bushing to turn around. The pulley also has dividers between the pulleys that stop the rope from jumping out. We also make and optional D-ring for the tack. This simulates a grommet and is perfect for people that want to use either a pulley hook or the North ratchet extension. Our tack strap allows for fine-tuning of the foot and tack. You pull it until you see the tension along the edge of the foot. Our built-in mast pad, with it’s 5/8” closed cell foam, is designed to protect your board and your feet, while at the same time, it flips up for easy rigging. The board texture can really destroy the foot of the sail. We counter this in two ways: 1) we sew a plastic bead along the edge of the foot and 2) we use a special chafe resistant tape on each side of the foot. Our clews have the best strength to weight ratio. We have no hard edges, or abrupt ending of layers that could cause the clew to blow out. A light clew makes a huge difference in the sailing weight of the sail. We also reinforce our clew grommet with a webbing strap to insure there is no slippage. A lot of sail companies are cutting corners by using thin, un-sewn sticky-back cloth on the leech. Not Us! Our wave sails have two ply leech reinforcements that are sewn permanently in place. All sails have Technora cloth on the leech for lightweight strength. We use only RBS epoxy battens in our sails. These are the lightest strongest battens in the world. Each batten is custom tapered for the exact location in the sail. Our screw batten tension is no thicker than the batten and weighs less than 16 grams each. We store our batten tensioner key at the tack of the sail for easy batten tuning. Ezzy Sails have had the reputation of being bombproof. We have worked very hard over the past few years to lighten our sails, while still retaining their strength. Inventions like the Endobatten have taken almost a pound of the sail’s weight because we no longer need all of the layers to make batten pockets. Our Specter X-Film has allowed us to use the strength and lightness of Spectra to make a lightweight bulletproof cloth. Our tri-lite weighs almost half as much as 7 mil monofilm. We are obsessed with the desire to make the absolutely best quality windsurfing sails in the world. That’s why we rig EVERY sail that we produce. There is no other sailmaker in the world that can make this claim. Why don’t other companies do the same? What does us rigging every sail mean for the customers? It means that you (and we at Ezzy) can rest assured the sail will rig and sail perfectly.